Two special Episode Fact Files are going to be posted today and tomorrow, talking about the two episode this last two updates are based on. On Sunday, May 14th, 1995, Fox aired “Lemon of Troy”, the 24th episode of Season 6 and the 127th episode to date. This Episode Fact File will recap the episode with all the infos we’ve on this episode. Get the scoop right after the jump! The children of Springfield wage war on Shelbyville, after their beloved town lemon tree comes up missing. The fathers of Springfield take Ned‘s RV to search for their boys. 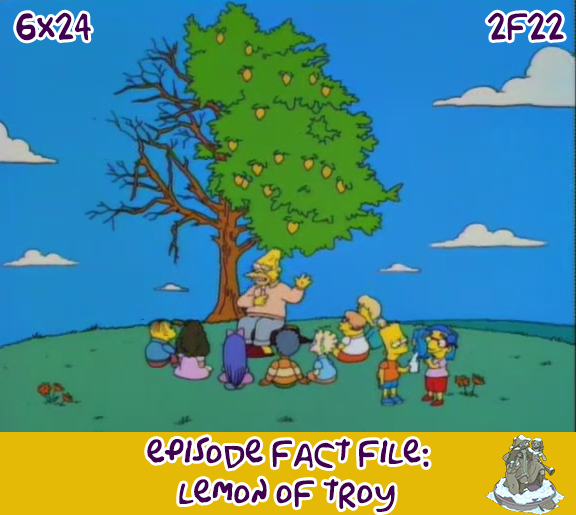 Episode Details: ‘Lemon of Troy’ is the 24th episode of Season 6 as well as the 127th episode of The Simpsons. The episode aired on FOX on May 14th, 1995 and was written by Brent Forrester and was directed by Jim Reardon with David Mirkin as show runner. The scene is black and white, and the couch, TV, and other living room furniture have an 1930s appearance; the family runs in, wearing Mickey Mouse style white gloves and big smiles, dancing. Marge catches Bart writing his name in wet cement, and lectures him on town pride. Her method of repeating herself during the speech causes her words to stick in Bart‘s mind, and he soon begins to learn more about the City of Springfield. Bart soon comes across Milhouse, who is selling lemonade. When the supply runs out, Milhouse takes Bart to the town’s beloved lemon tree. As Bart remarks how great Springfield is, they encounter some kids from Shelbyville. After a small bout with words, the kids from Shelbyville leave. It is then the kids notice Grandpa, who tells them the story about the lemon tree. The land the lemon tree was planted on was where town founders Jebediah Springfield and Shelbyville Manhattan first settled. However, Shelbyville was adamant that he live in a town that gave a person the right to marry their cousins. This did not sit well with Jebediah, and each man took settlers and formed their own respective towns. The citizens of Springfield planted the lemon tree, since lemons were the sweetest fruit available at that time. Sometime afterwards, the boys return to the lemon tree, only to find it has been stolen, with some tracks leading right into Shelbyville. Bart, Milhouse, Nelson, Martin, Todd, and Database all head into Shelbyville to get the tree back. When Marge finds out what Bart is up to, she gets Homer and several other parents to go to Shelbyville and find them (with Homer insisting Ned Flanders drive them in his RV). The boys eventually find the tree, but it’s in the car-impound lot being guarded by the Shelbyvillian boys. When the parents eventually find the kids, Homer soon becomes upset, and demands the owner of the impound lot return the tree. His request is laughingly refuted, and everyone begins to return to Springfield. However, Bart soon hatches a plan. Flanders illegally parks his RV which then gets impounded. After a close call, they take back the lemon tree, and return it to its rightful place. In the aftermath, old men in both Springfield and Shelbyville provide their own ending to the tale. In Springfield, Grandpa tells of the triumphant return of the tree by the ‘heroes of Springfield,’ to which Bart and Milhouse celebrate with a glass of lemonade (from a few lemon drops, and a whole lot of sugar). In Shelbyville, an old man claims a triumphant banishment of the old lemon tree by ‘the heroes of Shelbyville,’ claiming the old lemon tree was banished because it was haunted. He and several other children then drink some turnip juice, much to the distaste of the children. RECEPTION! : Lemon of Troy finished 55th in the ratings for May 11 to May 17, 1995, with a Nielsen rating of 8.1. It received mostly positive reviews from TV critics. The episode’s title is a reference to Helen of Troy. In the couch gag, the Simpsons family is wearing Mickey Mouse gloves. When Milhouse makes peace with his Milhouse, he says, “So this is what it feels like when doves cry”, which is a reference to the song “When Doves Cry” by Prince. “Hark to the Tale of Nelson“, the song which Martin sings after Nelson stops a Shelbyville boy from beating him up, is sung to the tune of the theme from the Western TV series The Rifleman, which aired from 1958 to 1963. When Bart tries to escape the tiger pit, he remembers his class on Roman numerals by adding II (2) to V (5) by thinking of Rocky and its sequels. He imagines a nonexistent “Rocky VII: Adrian’s Revenge”. In 2006, there was a sixth Rocky film which did not have a Roman numeral, simply being called Rocky Balboa, and in this film Rocky was a widower as Adrian died of cancer since the events of the fifth film. While uncover, Bart is asked by two Shelbyvillian boys on how come he isn’t seen at their school. One boy asks him what “Two plus two,” Bart answers, “Five,” which convinces the boy. This is a reference to the work 1984, and that Winston Smith was forced to accept the concept. Bart trying to fly using aerosol cans is a reference to the TV Show My Secret Identity. The episode may be a reference to the Troy Lemon law firm in Ohio. After Bart labels Todd the “Quiet religious guy who ends up going crazy,” Todd can be seen looking at the fourth wall nervously. When Database questions going into Shelbyville, Todd‘s colors change, making him resemble Lewis Clark. At the end, Bart, Martin and Milhouse are among the kids listening to Grampa tell the story of the voyage into Shelbyville, even though they were three of the people who recaptured the lemon tree. When Bart assembles the boys and tells them how it went, he forgets to tell Database about his role. Lisa says that town pride has been going downhill ever since the lake caught fire. Pollution in the lake also causes problems for Springfield in The Simpsons Movie. Bart mentions Springfield has many angel sightings. There was a angel skeleton discovered in Lisa the Skeptic. If you look behind the boys when they enter Shelbyville, you can see two girls flying a kite at the border, one of whom is Lisa. The other is Samantha Stankey, Milhouse‘s ex from the episode “Bart’s Friend Falls in Love“. That is all for this first special of 2017 of the Episode Fact Files, see you all tomorrow for the second on “Homer the Heretic”! I would like to thank WikiSimpsons for the information for this post and Nathan for the base design of it. This pictures and videos are from the “Lemon of Troy” episode of FOX show The Simpsons. Their use is believed to qualify as fair use under United States copyright law. Previous “The Great Phatsby” Episode Tie-In Teaser: Last hours!